* Applies to eligible staterooms on selected 2018 sailings. ** Applies to selected sailings from Southampton only. Terms and conditions apply. Cruises to: Asia, Australia & New Zealand, Bahamas, Bermuda, Canada & Alaska, Caribbean, Northern Europe, Mediterranean, South America, Ocean Crossings Middle East & India. Royal Caribbean offers 4* Premium cruise ships that are suited to all ages. Royal Caribbean has fantastic on board facilities and suit everyone’s tastes and needs. Each ship offers facilities for children including kids clubs and games rooms. With a relaxed approach to life on board guests have the option to ‘dress to impress’ or relax in their shorts. Be as adventurous as you want or just spend your days by the pool or exploring the new destinations. Dining in the main dining room offers the option of traditional 2 sitting dining option; however the open sitting dining is also available. A choice of alternative dining options are available (some at a supplement) or a more casual approach to dining is available at the Windjammer Café. 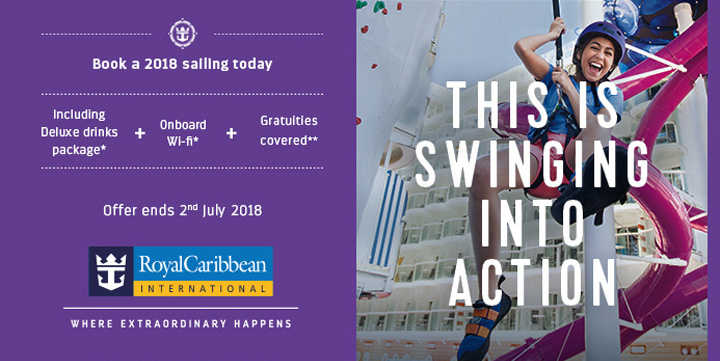 Royal Caribbean attracts American guests on fly cruise sailings and currency on board is US$, however with a choice of fantastic itineraries sailing from the UK, this attracts more British guests. Cruise itineraries range from 2 night short breaks to 18 night Australian itineraries and Royal Caribbean also offer sailings from UK ports to Europe or fly cruise itineraries, further afield. You also have the option to extend your holiday the with CruiseTour packages available. Gratuities can be pre-paid at the time of booking. Alternatively, they will charge per guest per day which will be automatically added to your on board account. For guests in a Junior suite. Service charges are also added to all bar purchases. Life on board a Royal Caribbean ship is a truly amazing, unforgettable experience, to encounter again and again..